The past decade has seen a real boom in technology and innovation, and the digitalisation of existing railway assets alongside brand-new railway technologies are making ground-breaking strides in keeping the rail industry at the very forefront of this technological boom. The railway sector has a well-deserved reputation for embracing new technological advances to improve their operations, and with estimates putting the total population at 8.6 billion by mid-2030, change is necessary. The adoption of digital technologies is a cost-effective way of releasing significant additional capacity on the existing network and the successful implementation of digitalised initiatives can streamline operations. In conjunction with the UIC, the Digital Rail Revolution conference will focus on some of the most important rail digital initiatives taking place around the world and discuss and debate what the future of the rail industry may look like. 09:10 - Opening panel: Why invest in digitalisation? 12:30 - A new milestone due to digitalisation. 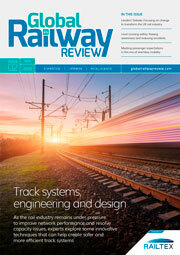 How can train monitoring help you to reduce downtime and streamline maintenance resources? Harald Jony, Managing Director, WienCont Container Terminal Gesellschaft m.b.H.